We have four runners in two states over the next few days - and hopefully there are winners amongst them! Kicking off the action is Black Tomahawk who takes his place in the ninth heat of the NJT Series at Ballarat on Wednesday. "He was slightly disappointing last start," Michael Moroney said, "but he did have a month between runs and he has trained on well." Drawn nicely in barrier one for Thomas Sadler, the Seul Amour gelding should get a good run and he will appreciate a drop in class. "He should get a good run from the inside barrier and he looks hard to beat at this level." 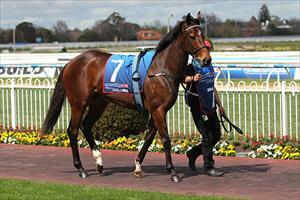 Our other Wednesday runner is Habitual Offender who contests the Cellarbrations Handicap at Warwick Farm. Coming in a few gates after scratchings, the top weight is another down in class having been a bit below his best at his most recent outing. "He too was a bit disappointing but Robbie in Sydney reports that he has been very happy with him since." "He is an on speed horse in a race that looks to have a bit of pace in it but with Lester Grace's claim he is well in." The Bunsta is another of our NSW runners, the promising four-year-old lining up in the Neil Perry Handicap at Hawkesbury on Thursday. An impressive maiden winner at his most recent outing, the son of Pentire rises in grade but Moroney is confident that he can measure up. "It is a stronger race but he won well enough to suggest that he can take the next step up." "He is going to be suited over a bit longer but the 1400m suits at this stage and he looks a top chance for the double." Melbourne Truck Centre Handicap over 1500m. To be ridden by Steven Arnold, the three-year-old has been game in the placings at his last couple of starts and a win is not far away. "He is going really well and he is bred to appreciate a rise in distance," said Moroney, adding that "any rain about would help him."